You can quickly tell Inbox not to show you particular emails until much, much later. One of the great things about Google Inbox's snooze function is being able to set the exact date and time to resurface emails you intend to read and reply to later. Sometimes, though, you just want to get non-urgent emails out of the way without thinking too hard. 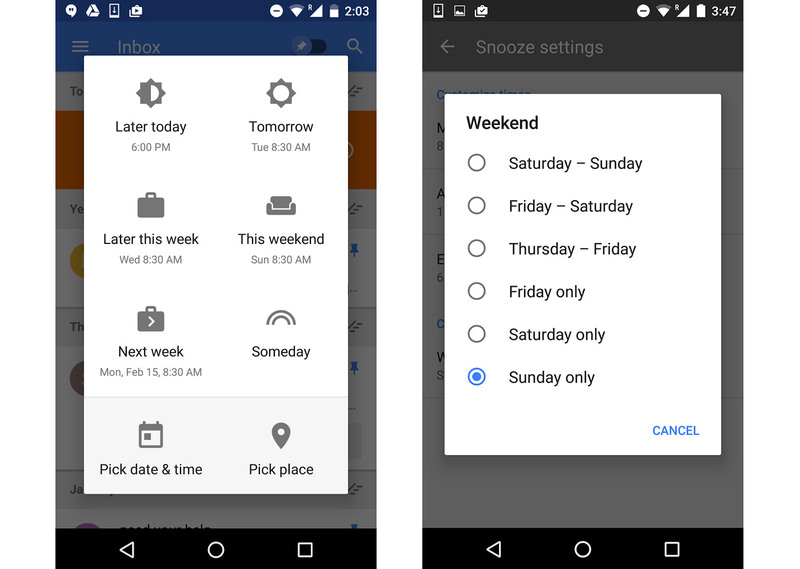 This latest Inbox by Gmail update allows you to do just that. Now, when you choose to toss a digital missive into your read-it-much-much-later pile, you can choose from two new snooze times: Later this week and This weekend. And since different people have different weekends, you can choose a particular day when you think you'll be ready to face what you've put off. They sound a bit dangerous for the eternal procrastinator, but incredibly useful for people who have lot going on in their lives. Google is rolling out these features over the next week, so you'll be able to use them soon enough. Correction: This post originally attributed some additional features recently added to the Android Gmail app to Google's Inbox apps. These features appear to still be exclusive only to Gmail for Android.